VIDEO - A military helicopter carrying six Israeli soldiers and one Romanian crashed Monday in mountainous terrain near Brasov, in central Romania. According to local sources, seven bodies had been recovered by rescue forces at the crash site by nighttime. The Israelis on board the chopper included four IDF pilots and two airborne mechanics. The IDF released on Monday night the names of the six Israeli crew members. The pilots were named as Lt. Col (Res.) Avner Goldman (48), Modi'in; Lt. Col. Daniel Shipenbauer (43), Kidron; Maj. Yahel Keshet (33), Hatzerim and Maj. Lior Shai (28), Tel-Nof. The technicians are Lt. Nir Lakrif (25), Tel- Nof and Sergeant 1st Class Oren Cohen (24) of Rehovot. 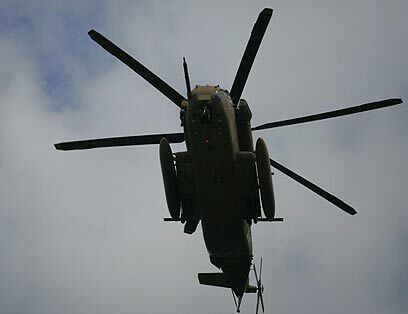 According to Bucharest media reports, the Romanian Defense Ministry said the helicopter, a CH-53 Sikorsky, crashed during Blue Sky 2010 – an 11-day joint Romanian-Israeli aviation exercise. The exercise began on July 18 and is set to conclude on July 29. Earlier, Romanian Defense Ministry Spokesman Constantin Spanu said officials were scrambling to reach the crash site, located near the town of Zarnesti, some 75 miles northwest of Bucharest. The rescue mission included a medevac, as well as Israeli and Romanian ground troops, assisted by local police and medical personnel. IDF sources told Ynet that all six families were notified that their loved ones were missing in action. An Israeli Air Force mission, including medical and rabbinate teams along with IAF officials, headed to Romania to assist in the search and rescue efforts. According to the Air Force, the missing helicopter was flying at low altitude in a two-aircraft formation as part of the exercise. 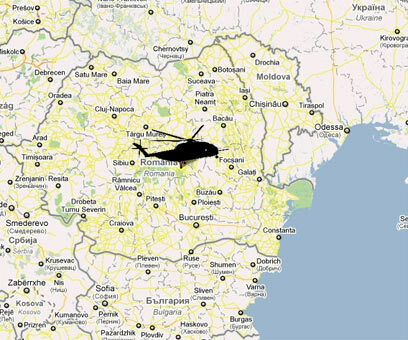 At some point, while flying over the Carpathian Mountains, one of the choppers radioed that it had lost visual and radio contact with its counterpart. Mission control was unable to resume it. According to some reports, one of the two Sikorsky helicopters that took part in the drill was forced to land at the beginning of the exercise, but it is unknown whether it was the same chopper that later crashed. IAF Chief Major-General Ido Nehushtan spoke with his Romanian colleague Monday night and the two have agreed on a joint inquiry of the event, which at this point is presumed a crash. Nehushtan later appointed a team headed by a brigadier general to condcut the probe. The CH-53 Sikorsky has been in use by the Israeli Air Force since the 1960s and is a versatile battlefield, heavy-lift cargo helicopter. The helicopter can carry up to 55 soldiers or 24 stretchers when used for rescue missions, and has maximum weight capacity of 33 tones. The CH-53 Sikorsky is 88 feet long with flight speed of 193 mph. In 1992, the IAF began upgrading its CH-53 Sikorsky fleet, introducing advanced navigation, avionic systems and electronic warfare systems, and changing the choppers' blades to titanium ones. The Israeli and Romanian Air Forces had been training together for the past six years. The agreement on cooperation was signed in September 2003 and the first training session was held in august of 2004. At the time, several aircraft flew to Romania in order to train at high-altitude terrain while facing different climate conditions than those in Israel. "When you fly at high altitude, the air is much thinner and the engines are less efficient and weaker," an Israeli officer who took part in the exercise session six years ago said at the time. "There is a special technique for flying a helicopter under those conditions, and this is precisely what we practiced. This exercise was very significant." "The highest mountain we have in Israel is the Hermon, and we don't train there much," the officer said at the time. "Hence, the training sessions in Romania's tall mountains were so important. After landing at an altitude of up to 5,000 feet, we experienced landing at an altitude of 9,000 feet for the first time." See all talkbacks "IDF soldiers killed in Romania helicopter crash"